This beautiful boy is called Brucey. Can’t quite believe it but he presented to Jacques back in May 2015 with a history of hind limd ataxia and paresis, he was also struggling to posture for toileting. 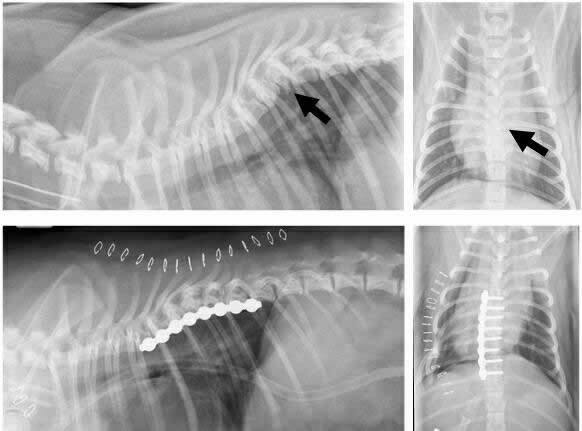 On investigation Brucey was found to have a condition called Hemivertebra (MRI image shown bottom right) which is a type of vertebral anomaly resulting from a lack of formation of one half of a vertebral body. 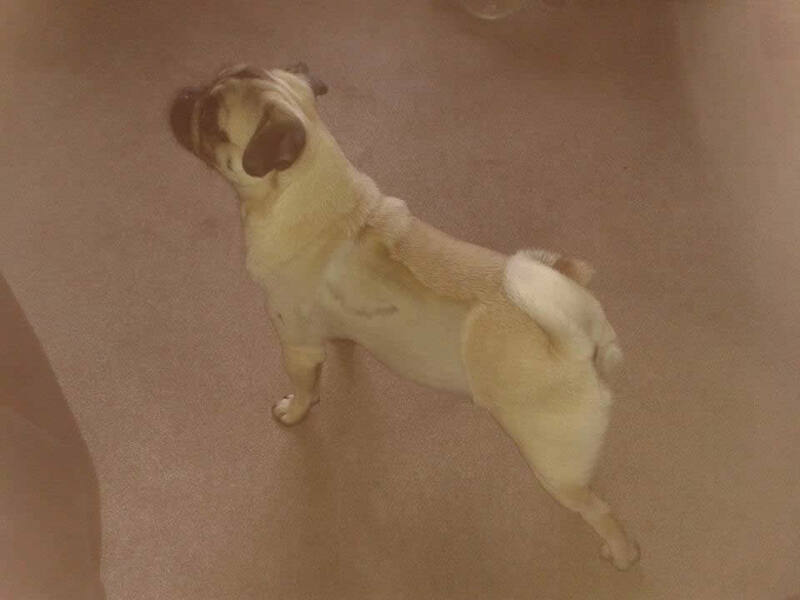 Due to the clinical signs already being shown by Brucey he required surgery to correct this, the surgery Brucey required is one developed by Jacques which we affectionately call a ‘Stretchy Pug’ though it’s official name is a distraction-fusion of the thoracic spine. It is a major surgery involving an incision through the chest wall to reach the affected vertebra and removing it, the spine is then distracted back into a normal shape and fused into position using a plate. A bone graft is then used to fill the space left by the abnormal vertebra. 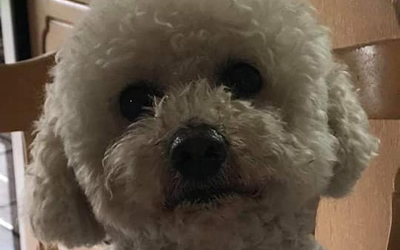 Brucey recovered from surgery very well and was up and about very quickly for a dog having had major surgery. Brucey was with us for about a week and he wormed his way into everyone’s affections a very sociable little pug and loved a cuddle. 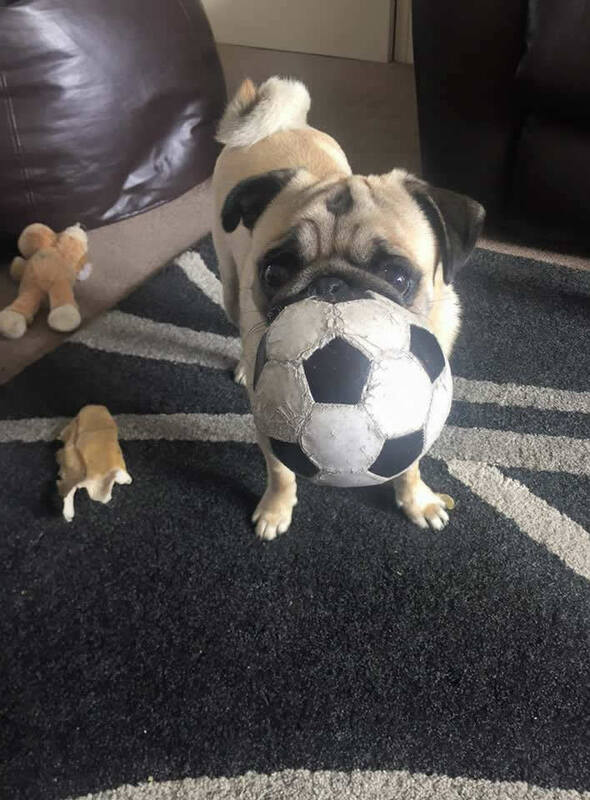 When he went home his fabulous owners continued his recovery and these are shots of him with his scar and then feeling better with his football. 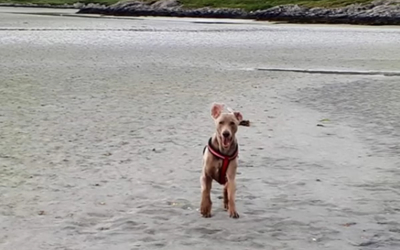 His owners report he now has a little sister called Lola who he is teaching to be just as sociable and fabulous as him. 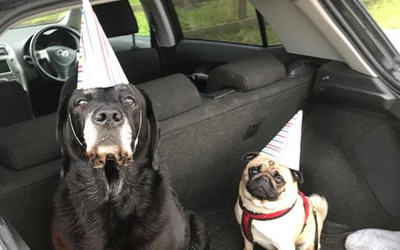 We wish you a fabulous time Brucey and family, you certainly left your mark on all at the hospital with your puggy good looks .